Grand-uncle of Germanicus, Claudius and Livilla. Gaius Octavius, hailed as Augustus, a title conferred to him by the Senate in 27 BC, was one of the most talented, energetic, and skillful politicians and administrators the Western world has ever known. 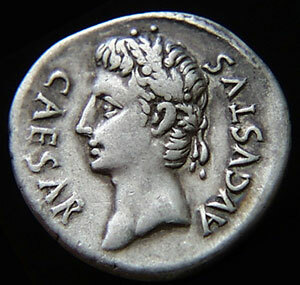 The son of Julius Caesar�s sister Julia, he had already made a name of his own as a military commander at the time Caesar was murdered and his will disclosed that Augustus has been made his heir. Only eighteen, Augustus embarked on a series of political maneuvers that allied him first with his uncle�s seasoned generals to avenge the death of Caesar in an alliance known as Triumvirate, and then pitted him against his former allies, Antonius and Lepidus, who had taken command, respectively, of the East and Africa. By 31 BC, it was all over. Lepidus was stripped of power, Antonius committed suicide. Octavian went on to rule the Roman Empire for another 40 years. With patience and tact he built a new political arrangement, the Roman Principate, which replaced the late Republic and laid the foundation of the Empire. Under him, the Roman state underwent a series of thoroughgoing political, economic, and social reforms, based on a constitutional settlement with the Roman Senate that allowed him to rule over and above the elected officials as princeps inter pares, or first among equals, as he modestly styled himself. It was, in fact, an autocratic regime, but under him the government brought peace, prosperity, and security for the ordinary Roman citizen and provincial alike, and allowed both for the transmission of the cultural heritage of the ancient world and the initial spread of the harbinger of the new world yet to come, Christianity.